Here are some uninflated OD numbers for comparison. I needed a drop from Naphula and I'm kinda sure Dvergr are neutral to piercing. Calcobrena (tankmaton) was not able to keep hate off of Aurore despite no OD (my mule PUP doesn't have Heyoka, however). I also don't know why 3x Wind maneuvers with no OD had harder-hitting Ranged Attacks than OD. Maybe OD doesn't triple Repeater or something and OD never procced a Double Shot? 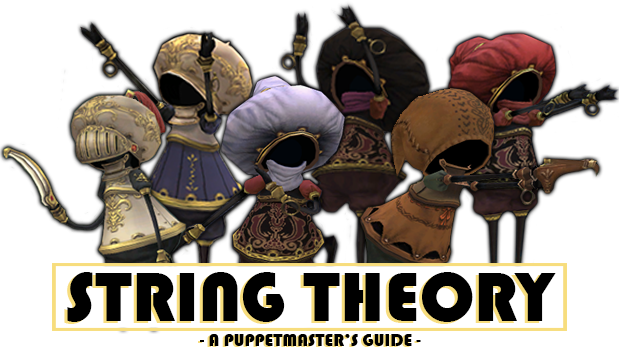 In any case, this seems like pretty viable ranged DPS that could be competitive with SMN for non-AFAC fights, tbh. Flame Holder also seems pretty decent with this, but it's impossible to keep up double Fire Maneuvers. Could be useful when Armor Shatterer is being forced over Arcuballista due to skillchaining. RNG maton also makes Animator P II (+1) rather interesting, I think. Don't have to worry about engaging it at exactly the right distance to avoid having the maton run in. And you can also deploy it without second thought even if you are meleeing on the master. The price has to come down a LOT but they would be great to get. Super awesome but they aren't going to pay for themselves unless you really use pup. 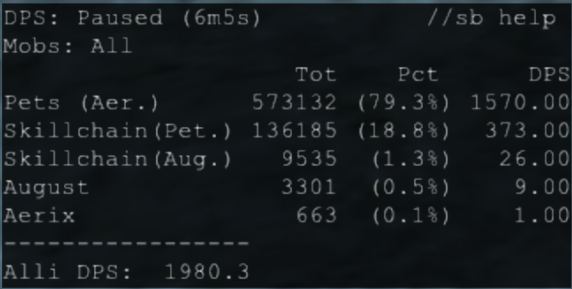 Not sure how much it matters, but I just parsed my full SS maton against a pretty well-geared non-Aymur BST using Blackbeardrandy on AAEV. 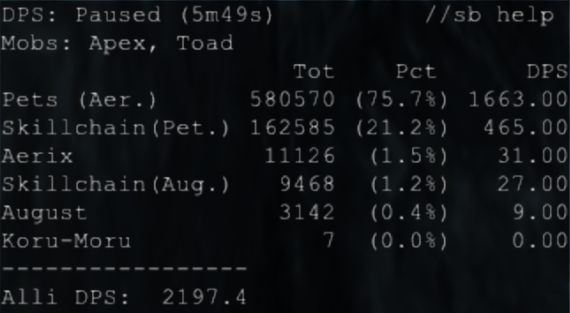 No OD or Unleash, but with Idris Bolster Torpor/Frailty and pet rolls the maton came out ahead by like ~6-7% usually. 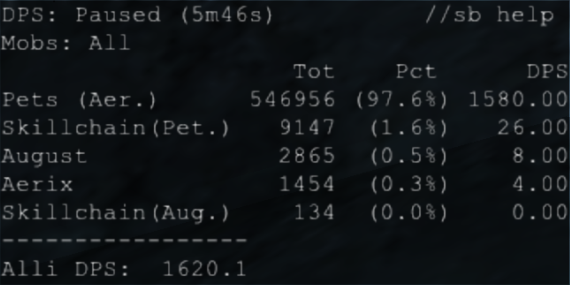 Not sure how much it matters, but I just parsed my RNG maton against a pretty well-geared non-Aymur BST using Blackbeardrandy on AAEV. 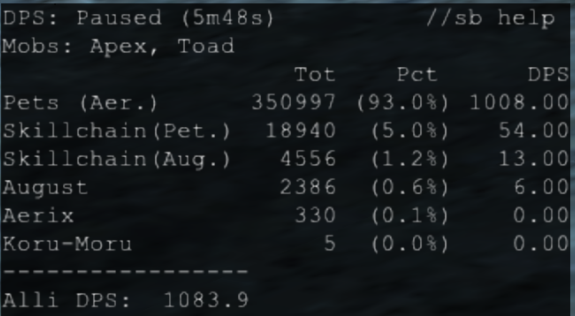 No OD or Unleash, but with Idris Bolster Torpor/Frailty and pet rolls the maton came out ahead by like ~6-7% usually. Ru'aun fight or Merit point fight? pet only work I take it? Aymur will make a big difference there. unless you already have Beast roll and geo-frailty helping cap Pdif. Still the tp bonus helps ALOT for bst. I think you would have to swap from Xiucoatl down to Ohtas for that comparison to be more meaningful. More fun to have Xiucoatl pup vs Aymur Bst imo. They did a straight Pup PET power boost. My Bst master has been outstripping my pet lately in damage. If I can get some boosts to pet, It will help balance things out again. It was the Escha version with pet burn only, and I know comparing Xiucoatl to no Aymur isn't fair, but I wasn't expecting the maton to win in the first place. And as far as I could tell Bolster Frailty and Beast Roll capped PDIF. I'm fairly sure it helped BST more than it helped my Automaton, in any case. Aerix, are you using maxed Xiucoatl Path C in your tests? You never specified so I was curious. Yes, that's what I used. The tiger was at about 3.7k or maybe 4k atk after JA buffs i think the pdif was capped. But yea my aymur isnt finished yet. But still this makes me hopeful for the bst update seeing what aerix did. Had run wild and spur up but pup still won. Was cool. Against a high level PLD? 4k Attack won't cap. If you are capping attack, you'll be doing close to 20k damage w/ razor fang. you would only be capped if the AAEV only had about 1k Defense. which, I highly doubt, maybe if you have more def down stacked on it. You will still get better damage from Vivacious Vickie than Blackbeard Randy. Get Am3 up on Aymur, and have a good Multiattack set going. Non-skillchain physical single target Vickie can hit harder. The def down helps, but any multi-attack procs, especially sporting bst collar +2 and Aymur Aftermath will make a Very big difference. Its why theoretically Vickie can hit up around 60k damage while randy will only get up to around 30k per razor fang. Its alot easier to get 30k on randy though, but its not terrible getting 40k from vickie. Yes Bolster frailty will help beast more than automaton methinks. Automaton can beef up its attack more readily and it has attuner. I would love to take a full pet alliance to Divergence. ack, actually don't think a pup can stay out of range for fetter tanking. Just to be clear, neither of us 1hr'd aside from the GEO. 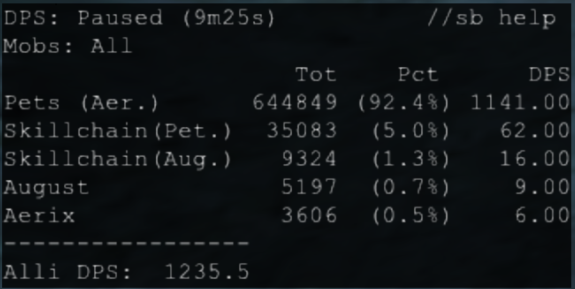 We also had Armor Shatterer's Defense Down on and there was no major damage difference between Idris BoG Frailty and Idris Bolster Frailty for Randy, so it's pretty likely it was attack-capped on AAEV. And we specifically made sure to face AAEV away from the pets due to the blocking. In any case, I was using triple Wind maneuvers (meaning Attuner didn't do a whole lot) and it only had like 2.8k Attack compared to Randy's 4k. 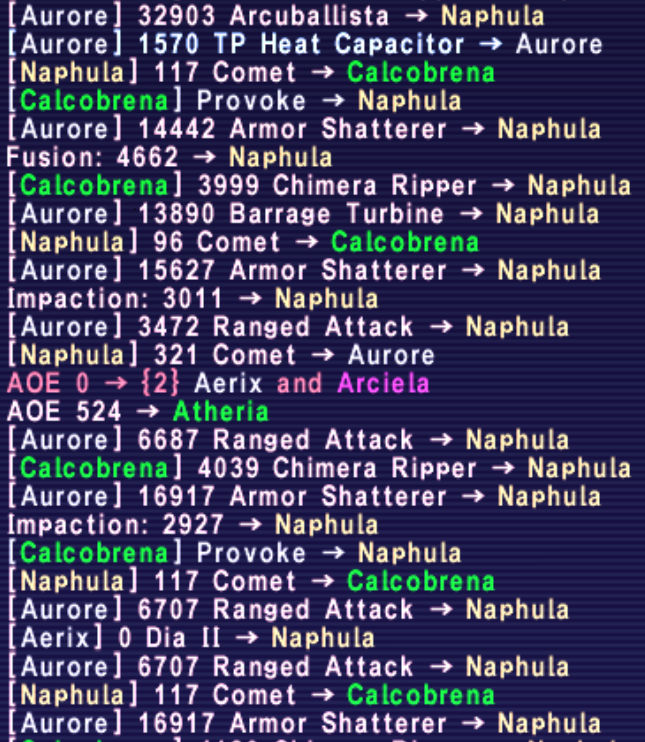 My maton's Arcuballista (very attack-dependent) was hitting for its full damage on AAEV like on Naphula, around 32k-33k. I can't comment on the other BST-related things because I don't play the job. If there were major damage concerns then it might have been a gear issue, but I don't know any other good BSTs on the server with whom to test this. Edit: Doesn't seem like broths for Vivacious Vickie are being sold anywhere on AH. Not even Asura has a good supply. Ah yea none of the crafters i know make the broth and none on ah but vickie would be nutz to try out I would love to. Sorry, I might be coming off too strong. I'm intrigued by the puzzle you present. Thank you for your testing on updated attachments. I really appreciate it. I can fix that, hopefully. I am farming Lucerewe Meat on my alt THF for a little bit. Going to try and make some Tantalizing Jugs on my cooking mule if anyone would like them to test with, free of charge. I know this is a PUP thread and I mean it for the PUP testing. I am curious to see the comparison to see how PUP fares since it was said the previous test with Randy wasn't as good as with Vickie would be. Sadly this is much the case for pup actually doing stuff. Most the game you can fairly easily set some scenarios up to get a decent comparison to math can pretty easily figure out how much dmg the ws it should do and how long it takes to get to tp... but will it tp at 1k or 7 seconds after getting to 3k who knows!?! So one fight 2 identical autos one can literally deal almost twice as much dmg lol. Can't even really just try to math out the difference between Xiucoatl and another weapon that well because of scaling makes the amount of gain different ws to ws. Auto AI to this day making my life hard! Come pay us a visit on Shiva and conduct your tests. Samusaron aka Seinda. Very high quality entertainment when he goes on one of his rants. Sadly, it's not an every day occurrence. Just an addendum in case people weren't aware of this: gear with +Automaton skills actually increase base damage for (ranged) attacks rather than just adding Accuracy/Attack. So Empy legs+1 and Naga Kyahan are pretty important for a shooting Sharpshot maton to increase its white damage. On low level mobs they were adding 70-80ish damage to each shot, which you can pretty much assume will get doubled on higher level stuff as triple Wind Maneuver gives the maton somewhere around a 85% "Double Shot" chance. So Empy legs+1 and Naga Kyahan are pretty important for a shooting Sharpshot maton to increase its white damage. Glad I brought it up with you yesterday since I carry both pieces in my setups. I mean sure you sacrifice a little bit of accuracy, but the amount is actually quite negligible in the grand scheme of things. Triple Wind + Scope 4 should pretty much make up for any Ranged Accuracy concerns that may arise. Best to just gear for max damage. Unfortunately, after some more testing it seems as though Repeater is unaffected by Optic Fibers, presumably because Double Shot is a JT that only activates via a JA, unlike Double Attack. Or the numbers for triple Wind Repeater on the wiki are incorrect. In any case, perhaps gearing for STP is the right way to go after all. 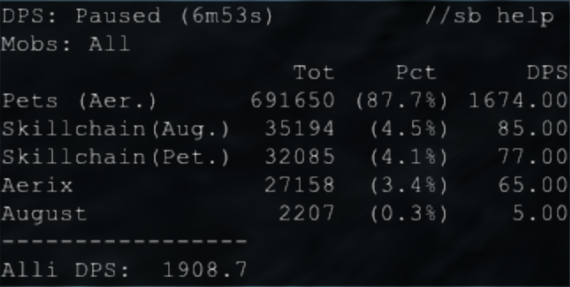 So I parsed a little to get some actual comparable numbers for our Automata. All testing was performed with Beast/Drachen/Companion's rolls. Conclusion: Companion's Roll (even with only Barataria Ring) pretty much makes STP builds completely obsolete. It also makes TPing via 3x Wind and Drum Magazine somewhat redundant as Arcuballistas still fire off frequently enough and for so much damage that it makes up for any loss of white damage from more frequent RAs. 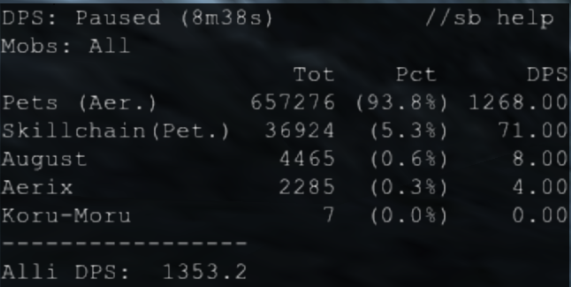 The last two tests were with our standard VE/SS melee maton setup for comparison and it shows that while the pure SS/SS is not bad, it's not even close to our strongest DD pet setup. So we can just go ahead and file that as "situationally useful" as usual. Can anyone update the attachment sets on bgwiki guide for the new ones they added? @Xilkk do you have any damage parses for your BST with rolls for comparison? Preferably on something high HP like Apex Toads with no special weaknesses.